연자는 일본의 갈라파고스 현상을 언급하였습니다. 다른 모든 나라와 일본이 다르다는 것입니다. 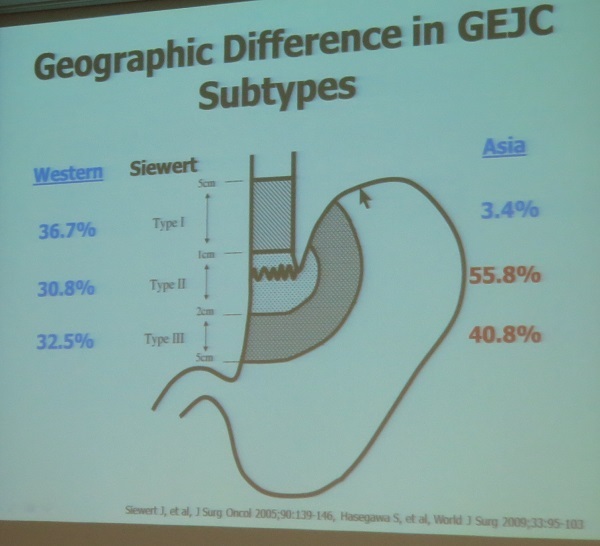 슬라이드의 제목이 "Why is Japanese treatment strategy of esophageal cancer different from rest of the world?"였습니다. 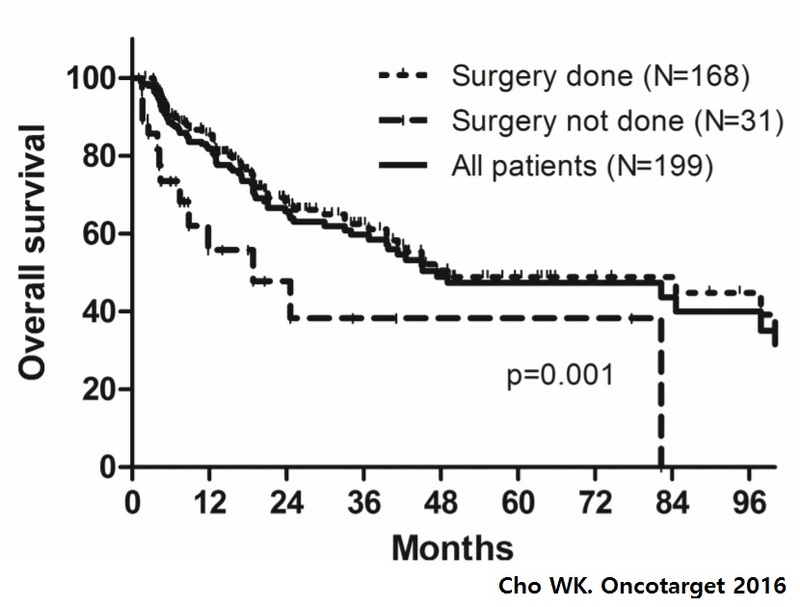 서양에서는 neoadjuvant chemoRT 가 neoadjuvant chemotherapy보다 우월하다고 보는 것이 일반적입니다. 그러나 일본에서는 neoadjuvant chemotherapy alone이 사용됩니다. 연자는 그에 대한 역사적 배경과 데이타를 설명하였습니다. 한마디로 "수술 범위가 넓으면 neoadjuvant chemotherapy alone이 충분하다. 서양은 작은 수술을 하기 때문에 neoadjuvant chemoRT가 필요하다"는 설명입니다. "Long before the introduction of TFD (three-field lymph node dissection), Japanese surgeons first applied preoperative radiotherapy to advanced esophageal cancer in the pursuit of better survival. It was related to late diagnosis of the disease in general at that time. This strategy was denied by JCOG8201. Since then, we have concentrated our interest in postoperative chemotherapy. As a backgroud, adjuvant chemotherapy was easier to adopt in the treatment strategy including extended lymphadenectomy. 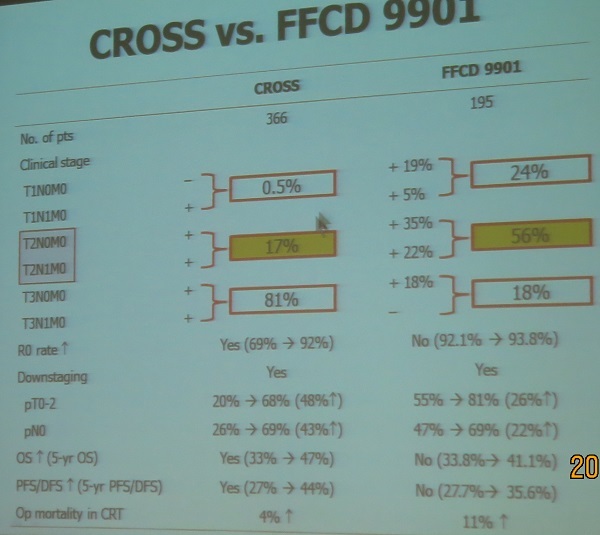 JCOG9204 showed better disease free survival in 'surgery + adjuvant chemotherapy' group over 'surgery alone' group. As the concept of 'neoadjuvant threatment' was introduced and became popular, and as the safety of TFD was improved on the other hand, neoadjuvant chemotherapy became our next target. JCOG9907 clearly showed that 'neoadjuvant chemotherapy + surgery' realized better survival than 'surgery + adjuvant chemotherapy'." Two field lymph node dissection에서 Three-field lymph node dissection (TFD)으로 수술 범위가 넓어졌습니다. 즉 upper mediastinal lymph nodes와 cervical lymph nodes까지 광범위하게 dissection 하는 것으로, 현저한 생존기간의 향상이 있었습니다. 일본에서 광범위한 lymph node dissection의 목적(일본에서 three-field lymph node sissection 수술에서 절제된 림프절은 100개 이상)을 당연히 therapeutic으로 보는데 반하여, 서양사람들은 이를 이해하지 못하고 있는 실정입니다. Udagawa 선생님은 "We should find out the way to survive, ourselves! "라는 인상적인 문구로 강의를 마쳤습니다. * 서울대학교 조석기 선생님 comment: (1) Extensive surgery 후에는 회복이 늦기 마련이므로 환자 만족도가 떨어질 수 있습니다. 대한민국 정부에서는 hospital length를 줄이려는 노력을 하고 있습니다. (2) 서울대학교에서도 chemoRT의 초기 성적이 좋지 않았습니다. 이후 경험이 쌓이면서 성적이 좋아졌습니다. 일본과 서양의 접근법을 비교할 때 이러한 점이 고려되어야 할 것 같습니다. 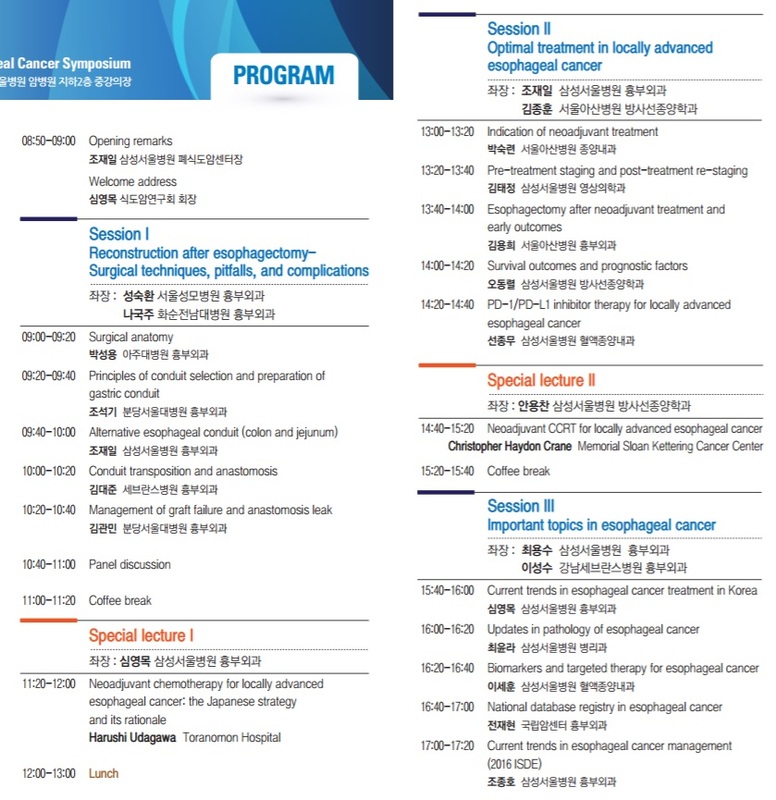 * Christopher Hayden Crane 선생님 (Memorial Sloan Kettering Cancer Cancer)comment: 서양의 임상연구에서 surgical specimen의 margin positive rate 40%, local recurrence 30%입니다. 일본은 어떤가요? → Udagawa 선생님 답변: 일본에서 margin positive rate는 5%입니다. Radial margin positive는 preoperative diagnosis가 잘못된 것이지요. 식도암은 여전히 치명적인 질병입니다. 2011년 우리나라 자료에 의하면 새로 발생한 환자 대비 사망자 비율은 67%입니다. Neoadjuvant chemoRT의 효과: 보다 advanced stage 환자를 대상으로 한 CROSS 연구는 neoadjuvant stage에 대한 positive result를 보였습니다 (van Hagen P. NEJM 2012). 상대적으로 less advanced stage 환자를 대상으로 한 FFCD 9901 연구 (Mariette. JCO 2014)는 negative result를 보였습니다. 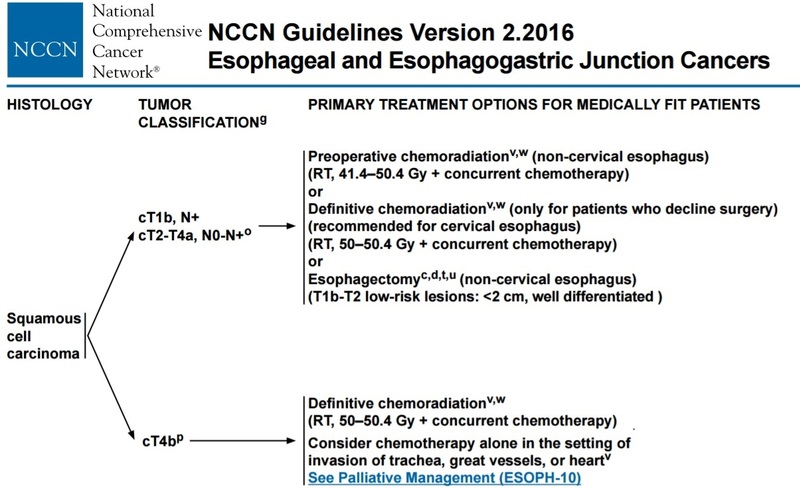 NCCN guideline 2016에는 cT1bN+M0 또는 cT2-T4aN0N+M0에서 preoperative chemoRT를 권하고 있습니다. 즉 submucosal cancer에서 LN양성인 경우와 LN와 무관하게 심달도가 proper muscle 이상인 경우는 preoperative chemoRT를 권한다는 것입니다. 그러나 cT2N0M0에 대한 치료 방침은 NCCN guideline과 다르게 접근되는 경우가 많습니다. 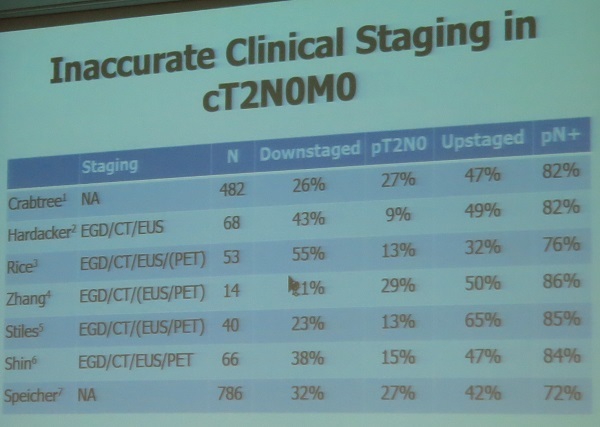 cT2N0M0의 clinical staging이 그리 정확하지 않다는 점도 문제입니다. Understaging 된 환자를 잘 고를 수 있어야 좋은 결과를 낼 수 있습니다. 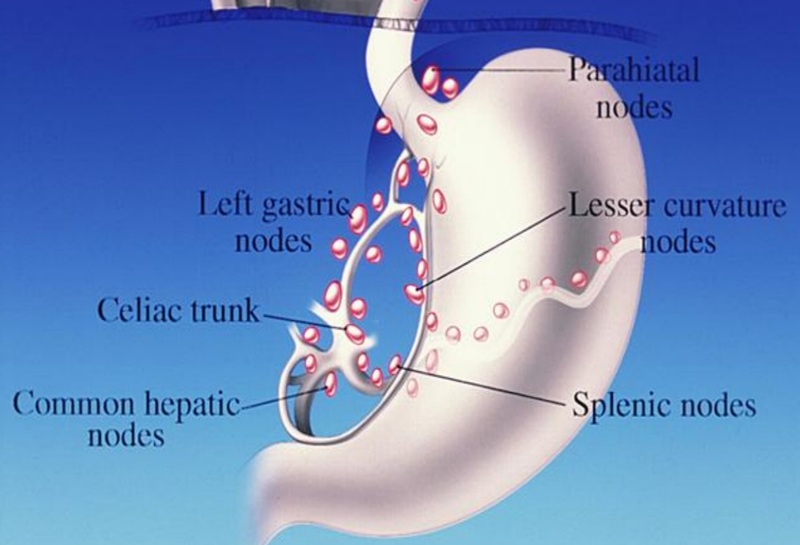 While some sudies have advocated for the use of preoperative therapy due to a high incidence of nodal dieases detected after resection (Zhang JQ. 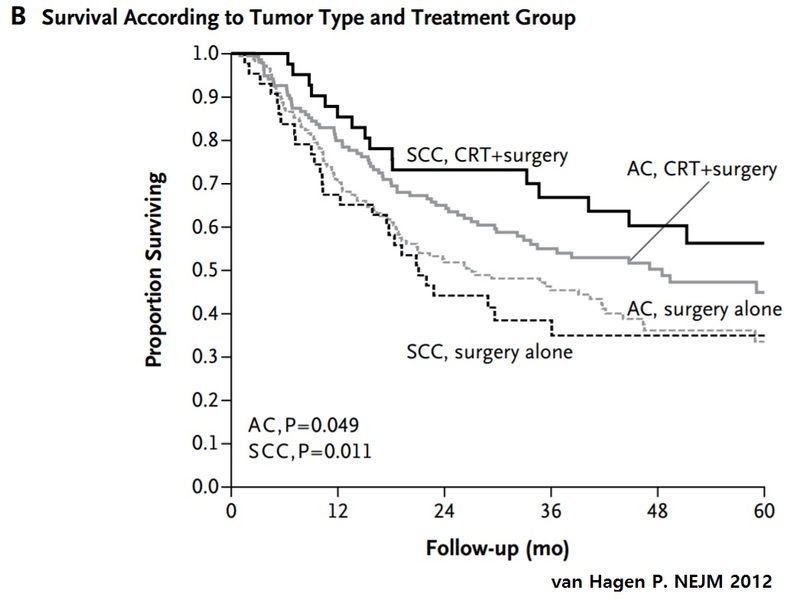 Ann Thorac Surg 2012), other studies have questioned whether preoperative therapy improves survival (Speicher PJ. J Thorac Oncol 2014). cT2N0M0의 preoperative chemoRT의 toxicity를 고려할 때, cT2N0M0는 preoperative chemoRT 없이 바로 수술을 시행할 수 있다고 생각됩니다. GE junction cancer를 식도암처럼 치료할 것인가, 위암처럼 치료할 것인지 논란입니다. 동서양의 조직형 차이가 큽니다. 폐암은 내년부터 8판이 사용될 예정인데 식도암은 언제 8판이 나올지 모릅니다. 따라서 식도암에서는 당분간 7판이 사용될 것입니다. 7판의 특징은 histologic grading이 T staging에 영향을 준다는 점입니다. N staging는 갯수로 단순해졌는데, 1-2개면 N1, 3-4개는 N2입니다. 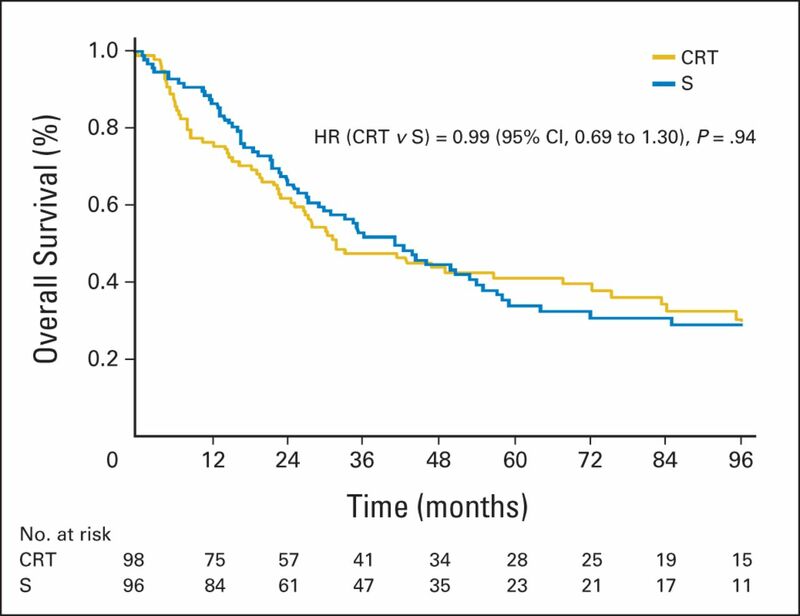 아산병원에서는 cT1-2N0는 수술, cT3/4N+는 neoadjuvant chemoRT을 하고 있습니다. CCRT에 반응이 좋으면 수술을 더하지 않고 CCRT를 계속하는 것이 좋다는 연구가 있습니다만, 아산병원의 자료에 의하면 CCRT 후 수술한 환자가 CCRT 단독보다 survival이 좋았습니다. 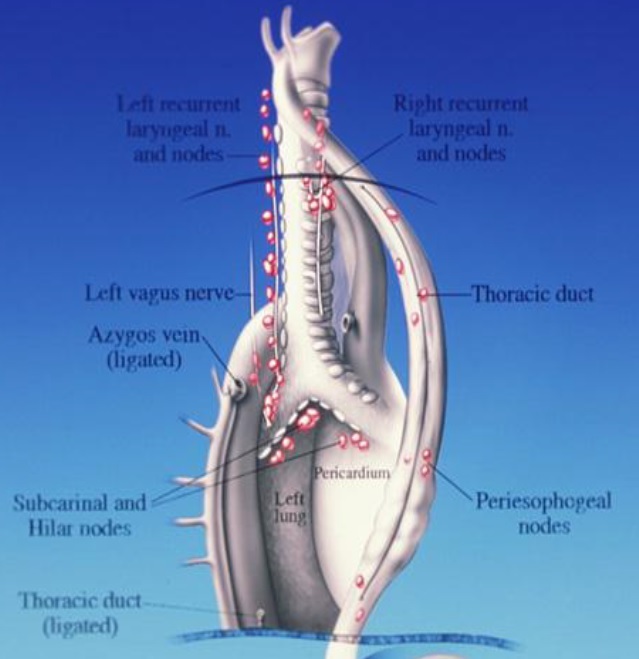 Time interval of esophagectomy/CCRT: The operation is usually performed 4 to 8 weeks after CCRT when the patient has fully recoverd. Longer waiting may increase the rate of pathologic complete reponses and may improve survival. 이준행 질문. 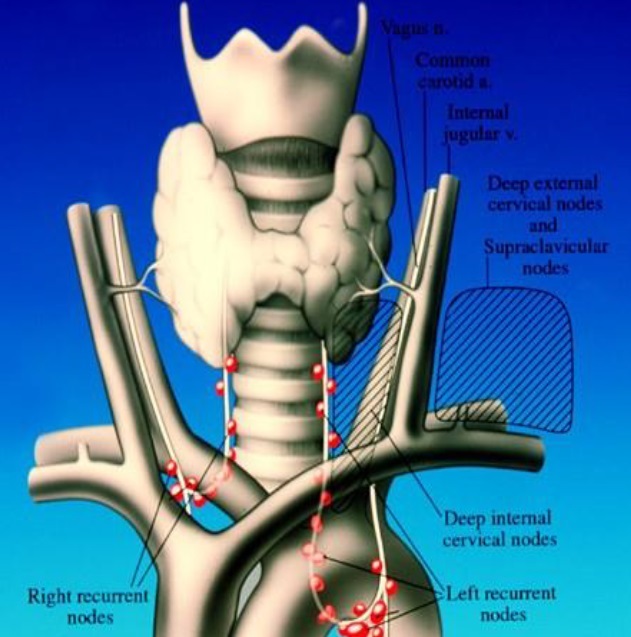 Clinically T2N0 로 평가되어 initially surgery를 했던 환자의 postop lymph node staging은 어떠하였는지요? CROSS trial의 longterm data가 2015년 발표되었는데 과거 자료를 확인하는 수준이었습니다 (Shapiro. 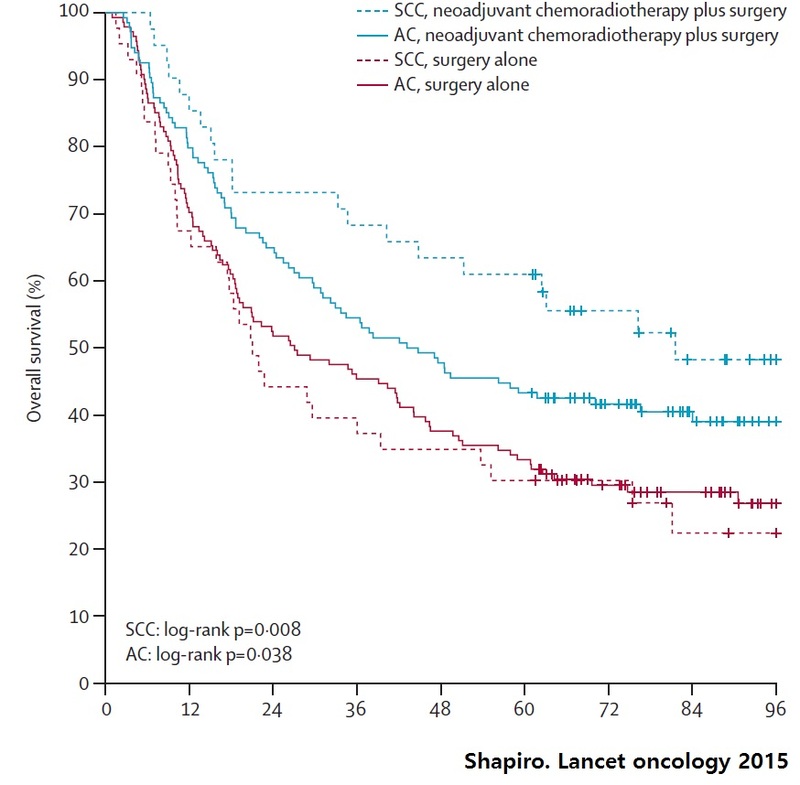 Lancet oncology 2015). 아래는 neoadjuvant chemoRT 받은 삼성서울병원 환자의 최근 결과입니다 (Cho WK. Oncotarget 2016). 당연한 이야기겠지만 수술받은 환자의 생존율이 더 좋았습니다. 물론 수술받지 않은 환자에서도 일정 부분 longterm survival 예가 있습니다. 아직까지는 neoadjuvant chemotherapy 후 CR이 왔더라도 수술을 하는 것이 표준이라고 생각됩니다. 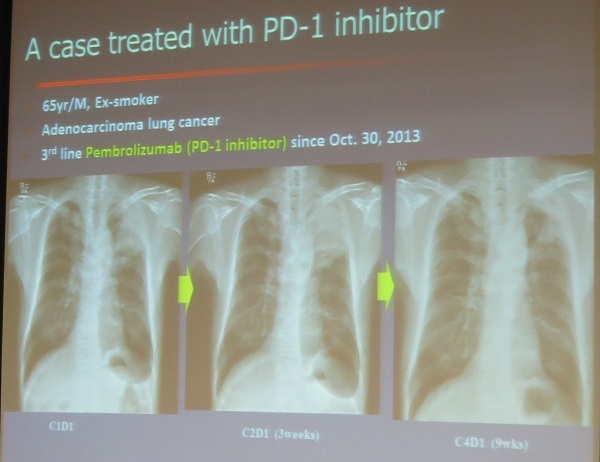 Pembrolizumab (PD-1 inhibitor) 사용 후 현저히 호전된 폐암 (adenocarcinoma) 증례를 보여주었습니다. 매우 조용한 치료라고 하셨습니다. 부작용이 거의 없기 때문입니다. 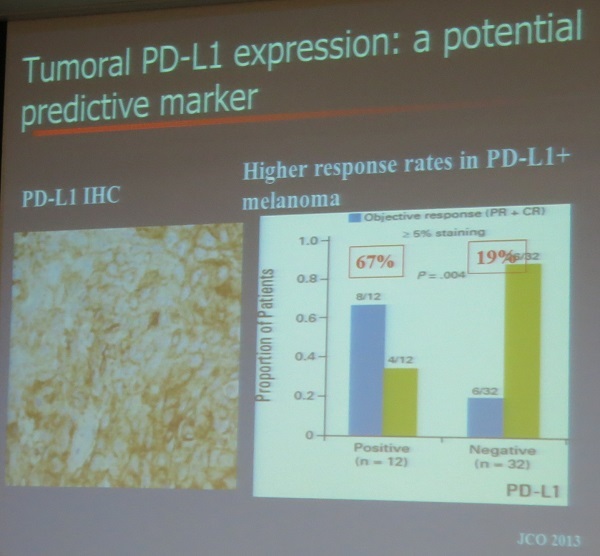 Melanoma에서 PD-L1 immunohistochemistry 양성이면 response rate가 67%인 반면 음성에서도 response rate가 19%이므로 과연 이를 predictive marker라고 할 수 있을지 아직 논란입니다. ChemoRT는 margin negative resection rate를 올립니다. 병소 위치에 따라 margin positive rate에 차이가 있습니다. 상부식도에서는 margin positive rate가 높습니다. Cardiopulmonary complication을 줄이기 위하여 dose delivery가 좋아야 합니다. * Udagawa 선생님 질문에 대한 연자의 답변: 미국의 R0 resection rate가 낮은 이유에 대하여 연자는 (1) 미국에는 한국, 일본, 중국과 같은 high volume center가 없다는 점, (2) 미국 환자들은 obesity가 많다는 점을 들었습니다. → 이에 대하여 좌장 안용찬 선생님은 (3) 일본 surgeon이 매우 aggressive하다는 점이 큰 차이를 만든다고 comment 하였습니다. * Floor의 한 선생님 comment: CROSS trial은 환자가 젊고 건강한 편이었습니다. 우리 환자들과 상당히 다릅니다. 우리나라에서 식도암은 모든 암의 1% 정도를 차지하고 있습니다. 매년 1,400명이 식도암으로 사망합니다. 식도암 수술예는 2014년의 경우 전국적으로 414명이었습니다 (이 중 62.8%인 260명이 삼성서울병원에서 수술을 받았음). 1994년부터 2014년까지 삼성서울병원에서 식도암 수술은 1,538예가 있었습니다. Mean age는 63.3세, 남자 93%, 2-FLND 85% & 3-FLND 10%, Median hospital stay 12일, 30 day mortality 0.8%였습니다. Squamous cell carcinoma, primary surgery, R0 resection의 경우 5년 생존율은 64.7%였습니다 (1기 82.7%, 2기 63.5%, 3기 41.2%, 4기 46.9%).